There was always a lot of talking about the "unstable" power supply of the 303 circuit design. Some people even think that there is a magic component, the "sumida coil" in the original 303, which they believe as necessary to reproduce the original sound. Doing some thinking about the circuit, some Google searching about what others had already found out, and some trials on my x0x, it gets pretty clear what is happening. The 9V goes into the voltage doubler, so we get round about 11V at C3 and about 24V at C5. As the current from the higher voltage is much lower (about 20mA) than from the first stage (some 200mA), this is not exactly doubled. For the 5V and 6V we see pretty boring standard regulators. First there is R1/C8 acting as low pass. Corner frequency is 16Hz. That is reasonably low to filter out any high frequency noise. Which *we* don't have here in our x0x-es, but which might be there in an original 303 supply, where this point is supplied by a switching DC/DC converter. Within the 303 DC/DC converter there is a regulation, consisting of D42 and Q42. This regulates the voltage at R172 to about 15.6V. Filtered by R1/C8 this 15.6V delivers the supply for IC16, an OP-Amp (ab)used as voltage regulator. First there are the 5.333V, used as virtual ground and as reference for the pitch CV. There is a proper reference diode (D43) and a trim (TM6) for the 5.333V, where this voltage is set to its exact value. The 5.333V is than multiplied by (1+R178/RR179)=(1+2200/1800)=11.85V, giving the "12V" supply for the analogue voltage. Up to the description above the only difference is the height of the supply for IC16. As the current draw from the analogue circuitry is about 10 to 20mA, there is 1 to 2V voltage drop across R172 and we have about 14V supply for IC16 within the 303 and about 22.5V within the x0x. As the AN1458 (Note: AN6562 is the same, Panasonic has used both numbers for the same chip) does a pretty good job at regulation, there is no difference in the output voltage. Until we consider component tolerances *and* the minimum difference IC16 needs between supply and output voltage. a) The AN1458 needs 1.5V minimum voltage difference between supply and output, else the output follows the supply. b) The 11.85V for the 12V are multiplied by 5% resistors from the (pretty exact) 5.333V. c) the 15V Z-Diode D42 has another 5% (or so) Tolerance. d) voltage drop across R172 is dependent of the current consumption by the analogue circuitry, and about 1 to 2V. The envelope generator draws a little more current during attack, as everything else is not fully constant - slightly more during a tone. If, by chance of the tolerance of our assembled components in our specific 303, the 12V is a little on the high side, the 15V from D42 is a little on the low side, and the voltage drop on R172 is on the high side (during attack), than our 12V will see a small break in. We will never see this on a x0x. Increasing R171 (to, as sometimes suggested, 220Ohms) does not change that, as there still is plenty of voltage to drop before IC16 might lose regulation. a) add an adjustable regulator (e.g. LM317) between C5 and R1, so one could mimic any voltage tolerance from the original supply. b) add a trim to R178/R179 divider, so the 12V could be adjusted. I did that on my x0x. One interesting point is, that adjusting the 12V in the range 5% resistors (all with regulation maintained) might give, there really is some change in the sound behavior of the x0x. So if you think "no two boxes sound the same" - here definitely is one of the sources. The boring thing: most of that is "Accent Amount", if you adjust the settings carefully you could bring back a "higher 12V sound" back to the "nominal 18.85V" sound. All what really is left is an slightly increased setting range. I'm still not sure about the 12V "dip" (regulation lost) sound. If overdone the attack gets weak, just add a little (which is a not very stable setting) and it might get a little more "living". Last edited by Nordcore on Sun Jul 30, 2017 10:55 am, edited 4 times in total. Neither the 303 nor the x0x-es I had here did have any noise or any other strange supply behavior. The supplies where always clean. That is the absolute height of the 12V power supply. That has as an astonishing large influence on the sound. Nothing magic: just the modulation amounts gets larger. That might make up for a very impressive sound difference between two boxes, if one box is on the upper end, the other on the lower end, of what ist to be expected from 5% tolerance resistors. This could be explored very easily by adding a trimm to R178/R179. The other sound influence is "starving the regulator", which can't happen in a x0x but *might* happen in some 303. That requires the supply of IC23 being lower than 1.5V above the "12V" output voltage. As the voltage drop at R1 is about 1 to 2 V that leads to 11.85V+1.5+1...2=14,35V-15.35V at the C5 side of R1. If there is more voltage, as in the x0x, the starvation will never happen. If there is less voltage, the regulation would not work at all, leading to unusable behavior. The sound effect could be easily tested by supplying an adjustable voltage to R1. As stated above I used a simple LM317 for that. What you have observed on the 5.333V is interesting, let me think about that. There is a little wrong thinking in the general view on the topic, biased or prejudice in regards of audio myth in general and a too statical view on current draw. how fast does a power supply delivers to the current draw? only matters in high power amplification? Why? small signals of a 303 draw power too.. a 303 gets warm..
Why have you investigated in the power supply myth in the first place? You hear differences? Many do, and the Power supply is big part of that experienced differences. Obviously since the circuit of a xox is otherwise very close to a real 303. But when we add just the facts stated in this thread we must assume a huge impact on the sound just by that static measurable differences.. Thats progress..some years ago even that so very audible fact was called a myth too. But back to the main question.. How do we emulate the effect of the 303 power supply ??? The postings here clearly state and prove that a simple resistor in one of the power lines wont do that. So a myth busted here. One for sure, power supplies do have audible fx in audio circuits. Even subtile and difficult to measure differences have audible results. That applies especially to power amplifiers. But the biggest effort in silent super stable power supplies you find in mic and measurement amps. A voltage might be stable, but limiting effects of the current supply abillity are very audible. The transients too fast and current demand after the transient actually rising to second long powerdraw demands on the power supply on bass frequencies. You hear weakness in the current supply ability way before you measure any voltage drop on your power rails. And a slow current draw reading wont show you much what happend here..since we have a very dynamical signal and load here..
Hello? what a huge fx that must have on a synth circuit. But why would that make the sound elastic? warbeling? ok.. the 303 typical rubber band sound is there way before it marbels.. its there on on any real 303, even on the ones that dont marbel at all ! All 303´s sound different..true.. but all of them have that elastic quality. So its not the marbeling alone we have to look into here. Where does that come from? what posible role can the sumida coil play here? I dont think the sumida coil is magical, its just a little transformator, ..nothing special, just far from a mathematical ideal multiplier. A component with complex dynamical nonlinearities. Its too easy to just call it an inferior supply.. There is a certain beauty in that inferiority and we need to emulate the beauty of that , not just the inferiority of it. What is causing that beauty? Current draw issues? likely, but what issues? how do they fx the sound? There are modern guitar amps that still use rectification valves..instead of cheap and way better diodes. And there are other modern guitar amps that model the behavior of a rectification valve in dsp to achieve a more realistic amp simulation. A rectification valve actually could be a thing that gives some properties of the 303 power supply.. but thats even less practical than sourcing a sumida coil. But the dffference between the dynamic current supply issues of a valve, versus the way faster diode show very much what kind of issues we might be into here. The properties of valve rectified amps versus teh same amp with diode rectification , reminds very much to the percieved differences between a xox and a 303 style power supply. So its quite likely that we miss out on the dynamical attributes of that 303 power supply. resonance on the supply rail is a point that must be very audible.. The mentioned 16hz filter.. such a filter has time domain properties..,.. And how does the coil reacts to that? Has such a resonating coil current storage abilities? Big coils in power transformators do have that. Why? we are getting closer to answer that question.. But no replacement circuit that works in sight yet. this is just an idea, but i got the itch.. and it itches..
low drop regulator to make 5V. A small 1W standard SIP-module, 5V to 15V DC/DC for the analogue part. Input up to 9V should be allowable = about 1W to dissipate by the regulator. That could be done by some copper on the PCB, no need for an extra heat sink. 1. a simple pin row for the serial signals would be nice. User not wanting to solder SMD could just plug an available USB-TTL-RS232 adapter cable to the pins. 2. FT230X instead of FT232. Cheaper. Less parts. Better. Less pins, so a little easier to solder. 3. Opto insulation for the USB-serial interface. As the USB comes with its own 5V and both (FT230X and ATMEGA) can drive a a LED directly, that is just two 6N138 plus two resistors. This eliminates the hum loop usually created by USB. 4. Optional: may be Micro USB jack. Sitting together with FT230X on a small piggy-back board. So that could be soldered professionally, eliminating the SMD for the DIY-part. MIDI: use 6N138 opto coupler, the now used type does *not* work reliable. theoretical guess work, mostly at best half educated. Its very easy to find out yourself.. just cut the power supply traces on a real 303 and feed the voltages from lab power supplies.. and the next step would be to conect that original 303 power supply to a xox.. I did that..have you? So that part is proven fact for me..self proven, not word of the internet prove..
HAs the coil something to do with the elastic balistics of the original roland power supply? Rather likely than unlikely. We have to assume that the coil does something for the special 303 sound.. Until somebody finds a replacement circuit that manages to sound similar without the coil. That has not happened sofar ! And this cant really happen when analytics ignore the exsitance of this coil..replace it with the most simple ohm law equations. Inductor math is usually not that simple. Especially under dynamic AC loads. Is it possible to simulate that coil behavior? thats the foggy part, but no myth. Its cheap polemics to call it a myth..its just an open question, and taliban like thinking barriers dont help to answer that question. Some even question the audible effect of power supply specs and design on audio amplification at all.. Thats a bit like claiming the earth to be flat in the 21th century. I do have the guts of a TR606, which has the same DC/DC, so I could do some measurements. The DC/DC delivers pretty exact 15V. Looking up the data sheet that is to be expected from the RD15EB3 Z-Diode D42. For maintaining 11.8V the AN1458 needs 13.3V. That leaves 1.7V at R172. Bringing Ohms law in: that is 17mA. Which is in the range we have to expect as current consumption! So this leads to the conclusion, that a slightly "dipping" 12V is not rare, but more or less common between original TB303. And any sound comparison, especially concerning the supply, gets completely useless w/o measured values of the nominal 12V output and the supply at pin 8 of IC16. Please keep in mind: the tolerances, given in the data sheet, are for all allowed operating conditions. At room temperature they are already tighter. Plus: the manufacturer does not want to have much "out of specs" parts being sorted out. So cheap mass products are typically a lot better than stated, because only then there is a high yield. On the bad side this night be exploited by the engineer: Use cheap components who will meet specs most of the time and sort out the very few units where it hasn't worked out. Here we have the R178/R179 voltage divider as example, where you might not calculate for the full +5% -5% worst case. As we have learned, the "loss of regulation" mode might be relative common, it might be interesting for some to exploit that sound effect. ... so here is the schematics to mimic the behavior of some(!) original TB303 within a x0xb0x. C8 is 100µF from the x0xb0x BOM. As long as the supply voltage for the AN1358 "regulator" IC23 is high enough to maintain regulation under all load conditions, the value does not change anything in a pretty wide range. But as we are going to exploit the loss of regulation "feature" seen on some original TB303, the time constant R1*C8 gets relevant and you might want that to be the same as in the original circuit. connect a scope to IC23-Pin 8. Set scope to AC input mode, about 500mV/div, pretty slow. Connect second channel of scope with same settings at IC23-Pin1. Let the x0x play a pattern. High resonance, some accent, accent turned up fully. You'll see the voltage at channel 1 moving slightly up and down with the varying load. Adjust RX3 so that channel 2 shows a few dips in the flat line. Yes, it is a voltage doubler. 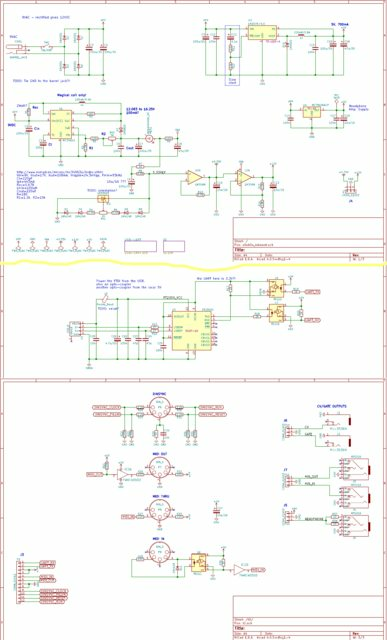 I've annotated the measured values in my schematic: 11 and 24V. Using 9V AC gives about 12V DC. We don't need large caps than, as there is plenty drop out voltage for the regulator. With 9...14V/AC/DC input we will need a switching regulator for the 5V. ... starting from the well regulated 5V *and* having the AN1458 "regulator" following, allows the use of a non regulated switcher. how about the AC/AC-or-AC/DC adaptor option? then stick the LM317 for the adjustable 15-ish volts, the LM7805, etc..? - a supposedly "weak" switching regulator for the adjustable "15-ish" voltage, which will feed the opamp "regulator"